On Tuesday, April 4th, Disney will release its next wave of Star Wars Tsum Tsum plushes! This release will be based on Episode III: Revenge of the Sith, and includes some pivotal characters from the prequel trilogy. 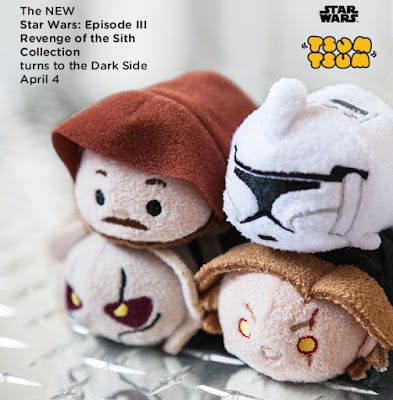 The Star Wars: Revenge of the Sith Tsum Tsum Collection includes stackably soft plush figures of Darth Vader (aka dark Anakin Skywalker), Obi-wan Kenobi, General Grievous and a Clone Trooper. All four of these awesome Star Wars Tsum Tsum plushes will be available in the popular 3.5” mini size at DisneyStore.com and Disney Store retail locations for $5.95.